Yaropolk Iziaslavych [Jaropolk Iziaslavyč], b ?, d 22 November 1086. Prince of Volhynia and Turiv (see Turiv-Pynsk principality); son of the Kyivan prince Iziaslav Yaroslavych. He married Iryna (Kunigunde), the daughter of Count Otto of Orlamünde-Reichlingen. In 1073 he and his father and brother, Sviatopolk II Iziaslavych, were expelled from Kyivan Rus’; they traveled to Poland and then to Germany. 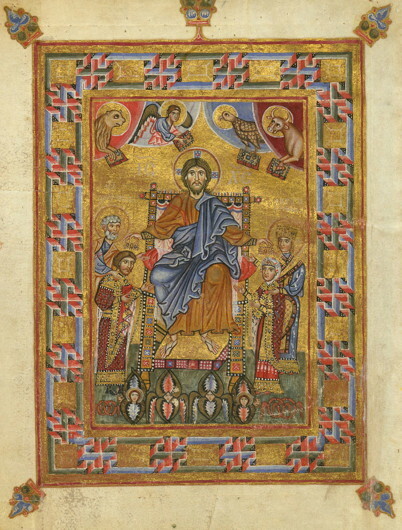 In 1075 Yaropolk petitioned Pope Gregory VII for support and was officially recognized as the ‘King of Rus'.’ The petition was recorded, along with miniatures of Yaropolk and his wife, in the Trier Psalter. In 1077 Yaropolk returned to Kyiv with his father and was granted the rule of Vyshhorod volost. In 1078 he mounted a campaign against Oleh (Mykhail) Sviatoslavych of Chernihiv, in which his father was killed. That event marked the separation of Volhynia (with the Volodymyr-Volynskyi principality and Turiv-Pynsk principality) from Kyiv principality. Yaropolk ruled Volhynia with the agreement of the Kyivan prince Vsevolod Yaroslavych, but he faced constant conflicts with the dynasty of Rostyslav Volodymyrovych. In 1084 his rule in Volhynia was overthrown by them and Davyd Ihorovych. In 1085 he petitioned Vsevolod to grant him Dorohobuzh and was refused; he took up the sword against Vsevolod but was forced to retreat from Volodymyr-Volynskyi and Lutsk into Poland. He was killed by the assassin Neradets (who was probably a secret agent of Riuryk Rostyslavych) and buried in the Church of Saint Peter in Kyiv.